Plans based on number of users and the types of legal information set up. Legisway Essentials (previously effacts) is a secure, cloud-based solution to find, summarize, share, audit and report on all your company's legal information, from entities, contracts, compliance, claims, IP, and more. With smart tools that help you manage risk and collaborate with other departments, it is more powerful than shared drives, spreadsheets or generic tools but easier to use (and more affordable!) than enterprise software. Effacts is an excellent product. This software is user-friendly and benefits multiple departments. 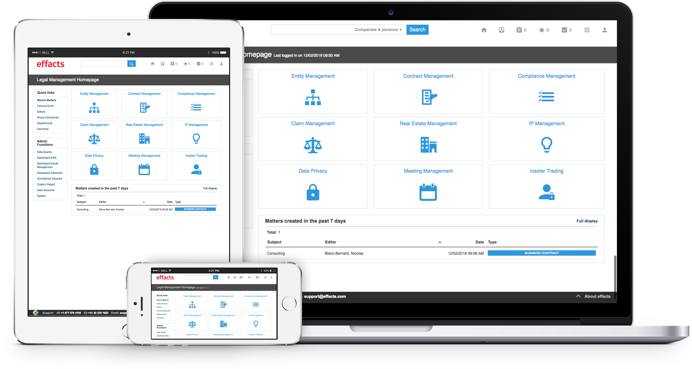 Pros: We most like the unlimited document storage, the connecting modules, and the ability to customize fields, alerts, and reports as needed. We are continuing to expand our capabilities with multiple users in other departments. Overall: Multiple departments can view critical documents and information stored in a central unlimited cloud-based location. Pros: WYSIWYG. No surprises and fairly straightforward. Liked how it could be customized for our nomenclature. Cons: document saving and editing. Cannot revise and track revisions to a document through Effacts. Have to resave and new matter number is assigned. Document sharing and common editing is not robust. Effacts is easy to use for tracking vendors and their associated contracts. Pros: Effacts allows you to easily run reports for upcoming contracts renewals. The system is able to be modified to fit our needs. Cons: You need to contact customer support when you want to add or delete a user. I wish the system administrator could do that within the system. Pros: functionality and speed. It is a very simple tool to get started and escalate to a larger project. The modules are really useful to any size of company. Pros: It is very user friendly and allows us to manage our fleet of power plants and sales contracts. The visual nature of the platform is very easy to use. Cons: The custom emails we receive when certain things are due can be tailored better. We would like to work with someone on the team to fix this in the new year. Pros: Great product. Keeps entities organized as well as officers. The organizational chart features is most helpful to manage large corporations. Cons: Would like to be able to add more folders and number them accordingly. Would like a general list that is not associated to the entities. perfect software for our small department. Pros: Easy to use - not too many features that we do not need that make things more complicated. We only use it within the legal department. Cons: Wish it was easier to get contracts into system (but not sure that is possible). It is time consuming to get all contracts into system. Cons: Not 100% sure how to get back to certain places when we are in contract entry mode. I often find myself going back to 'home' and then entering the 'contract management' section repetitively. That being said, I know that when I reach out to customer service they will do an excellent job responding.